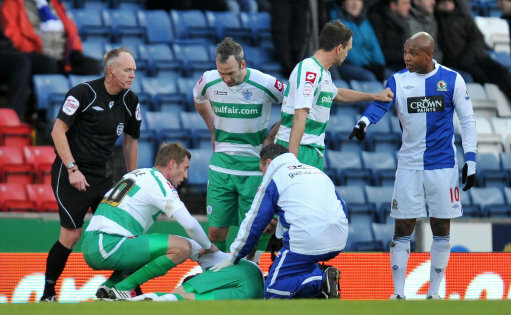 QPR striker Jamie Mackie has admonished the behaviour of ‘repulsive’ Blackburn winger El-Hadji Diouf after the Blackburn winger apparently goaded the stricken striker as he lay prostrate on the turf having just suffered a broken leg (a double fracture, no less) when the two sides met in the FA Cup on Saturday. “I’m lying on the floor with a bad injury and even his team-mates were embarrassed by what Diouf was saying. There’s no room for that in the game – and in my opinion he’s an absolute disgrace. “I’m trying hard not to think about Diouf. That’s because when I do it makes me want to snap my cast off and run up there and find him. “The lads were furious with Diouf. [Mackie] had broken both bones in his (lower) leg and Diouf is calling him all sorts on the pitch. There was no need to put the finger up and call him a disgrace and even the Blackburn people were embarrassed. “I can’t abide people like that, I don’t know why he wants to take on the world every week. For many years I have thought he (Diouf) was the gutter type – I was going to call him a sewer rat but that might be insulting to sewer rats. It’s not often I find myself siding with Neil Warnock, but it’s hard to argue with him on this particular occasion. Diouf is an odious little turd, and has once again proven himself to be little more than a sh*tty smear on the face of the modern game. what did diouf actually say i wonder ? @Gaptooth: The general consensus seems to be that Diouf said ‘F**k you and f**k your leg’ amongst other things, though nothing has been proven yet. @Gaptooth He said: F*** you and F*** your leg if the reports are to be believed. Anyone would think that Mackie wasn’t responsible for the tackle, that also resulted in a Blackburn player being stretchered off, given that all the focus is on Diouf….. I still hate Drogba more but this piece of scum is getting close now. He is that kind of guy. The kind that if they were to be killed sometime, nobody would ever regret them.